My dining companions and I met up for dinner over the weekend at VivoCity. As queues were the norm for most restaurants, we settled for one of the few exceptions. Located opposite Cyrstal Jade Jiang Nan, between Jpot and TungLok Signatures where seats were also available, is Nyonya & Baba. Having eaten and loved The Blue Ginger at Tanjong Pagar, we decided to try this Peranakan restaurant. Ordered a dinner set for two, with an additional bowl of rice, to share among three. For the soup and poultry, we chose Bakwang Kepeting over Hu Piao and Ayam Buah Keluak over Sate Ayam respectively. 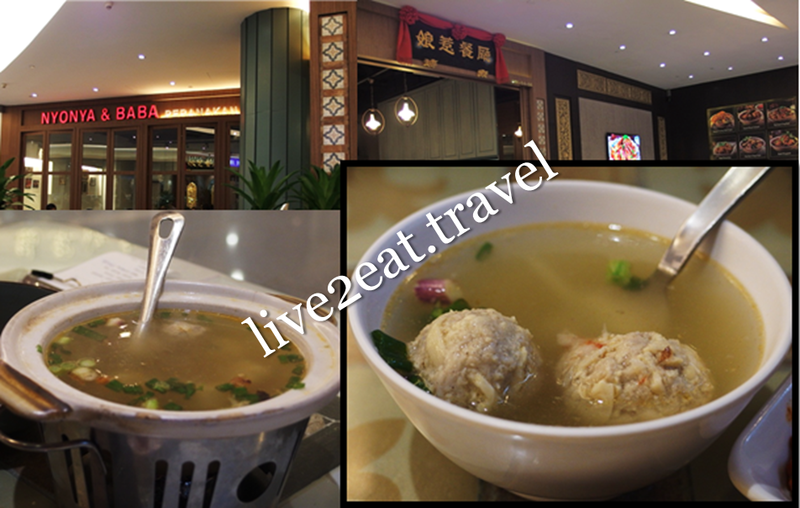 Seasoned meatballs made of minced pork, crabmeat and prawn in a surprisingly light broth were better than expected. While the chicken was tender, I did not like the sweet and spicy black nut gravy it was stewed in. Vegetable of Chap Chye came with black fungus, cabbage, mushroom and tang hoon or glass noodles. This traditional Nyonya delicacy with bean paste was too salty for my liking. And for other specialities, we changed Nyonya Ngo Hiang to Otak Otak. Could smell a nice aroma and bite into pieces of mackerel fish in the prawn paste, with just the right amount of yellow ginger and other spices but too much coconut milk. Instead of Sago Gula Melaka, we requested for Puloh Hitam as dessert. Black glutinous rice pudding with fresh coconut lightly poured on the surface was so sweet I cringed on the first mouthful and could not bring myself to have a second. More like black glutinous rice added into sugar syrup.